It might be the Galapagos Islands, or the Amazon rainforest, the Andes, volcanic Cotopaxi, or the incredible Ecuadorian Sierra that inspires you to start considering an adventure to Ecuador, but as soon as you start looking you’ll realise how much this small country has to offer. 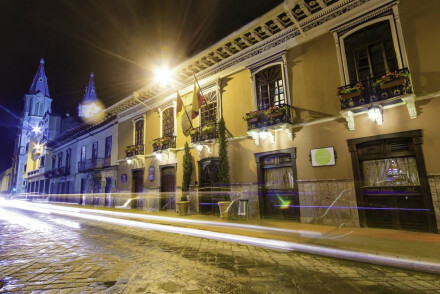 If you didn’t already know about them you’ll discover how many of Ecuador’s cities have historic, Unesco-listed centres lined with photogenic plazas and elegant colonial mansions. And you might be tempted by the beautiful coastline with its exotic marine life; or by the Amazon with its remote settlements; or by the Andes with their fields that roll into hills, and into mountains. Our recommendations for the best places to stay in Ecuador are spread across the country, and hopefully we’ve found something for everyone. Ecuador is ripe for adventure, adventurers and those with an adventurous spirit. It’s a fantastic place to walk, cycle or horse ride across and through. To count exotic bird species, or watch whales, or meet river dolphins. It’s a really, really difficult country to plan an itinerary for, because there are just so many unmissable sights and many people plan a visit to Ecuador thinking this will be their one visit. And then of course they’re proved wrong by the beauty of this landscape. Famously ‘in the clouds’ 3,000 metres above sea level, Quito is built on the foundations of an ancient Incan city, and the top layers today include a well preserved colonial centre and ancient churches in both the European and Moorish styles. One of the highlights of Quito, and a fantastic way to start any visit to Ecuador, is the Museo Templo del Sol Pintor Ortega Maila, a spectacular museum which explores Ecuador’s fascinating past. The isolated Galapagos Islands are an incredible haven for unusual endemic wildlife, from the giant tortoises to the land iguana, to the flightless cormorants. So incredible that it can be said to be behind the change in our entire idea of nature and our place in it. So a pretty incredible place to visit then. There are 19 islands, all different sizes and all worth visiting. Some of them have alien-like volcanic landscapes in shades of rustic reds, Espanola Island boasts a huge colony of waved albatross; Floreana Island teems with pink flamingos and green sea turtles; and Isabella, the main island, is inhabited by the famous giant tortoises. One of the greatest things about these islands is that there are no natural predators, meaning that the animals there have no fear of humans, allowing visitors to approach them to the point of touching them. Surrounding the islands is the Galapagos Marine Reserve, awash with corals, sharks, penguins, sea-lions and whales. So snorkelling is incredibly popular here too, along with whale watching. Before you set out for the Galapagos Islands you might stay in Guayaquil, a really charming port city with colourfully painted houses, numerous art galleries and a lively waterfront promenade. Guayaquil has been invaded by the Spanish, the Peruvians and pirates from both France and Britain, so it has some wonderful colonial monuments. The Parque Nacional Cotopaxi is another centrepiece of Ecuador’s natural beauty, with its snowcapped namesake the Cotopaxi Volcano and its paramo grasslands. The Parque Nacional Yasuní is the country’s largest national park, covering marshland, tropical rainforest and more grasslands and forest. This UNESCO Biosphere Reserve is home to jaguars, tapirs and pumas, as well as over 600 different species of bird. 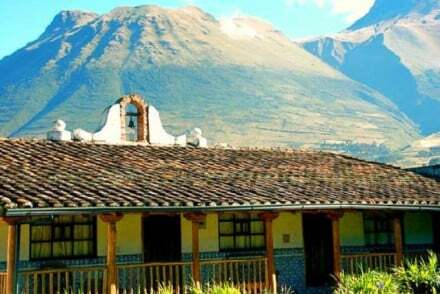 When it comes to smaller centres Otavalo, with its markets, Vilcabamba with its mountainous backdrop, and Papallacta, with its therapeutic hot springs all deserve a mention, and appear frequently in the stories of those returning from their return to Ecuador. In the heart of the historic centre, the Hotel Plaza Grande is an elegant, colonial-era five-star hotel with just 15 rooms, traditional architecture, fantastic cuisine and live opera. The Hotel Carlota is a 12 room boutique property with contemporary decor and large sash windows. The expansive roof terrace is a real highlight and a great place to sip cocktails and take in the sights. The bistro serves excellent modern fare. Casa Gangotena is a grand family mansion turned boutique hotel, which overlooks the lively Plaza San Francisco. 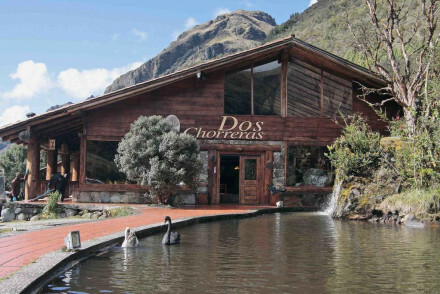 These 31 rooms are some of the finest accommodation in Quito, and the Ecuadorian fare in the restaurant is exceptional. 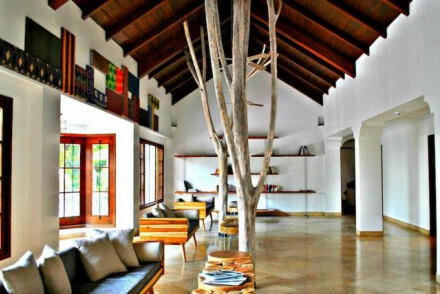 A contemporary twist to the ancient landscape, Pikaia Lodge is the height of luxury on Santa Cruz. An infinity pool, spa, and floor to ceiling windows have helped earn this hotel’s exceptional reputation. 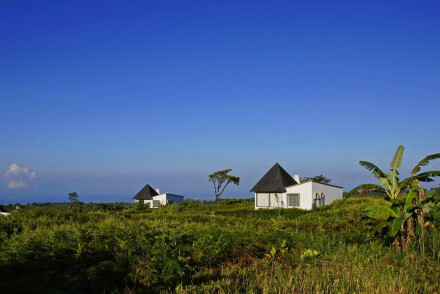 While the Galápagos Safari Camp is an eco-friendly hideaway deep in the forest with luxurious tents and natural décor. 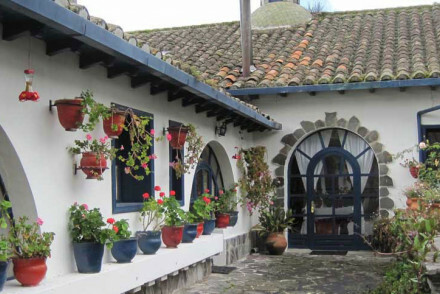 La Casona de la Ronda is an historic charmer in the heart of Quito’s charming historic centre. 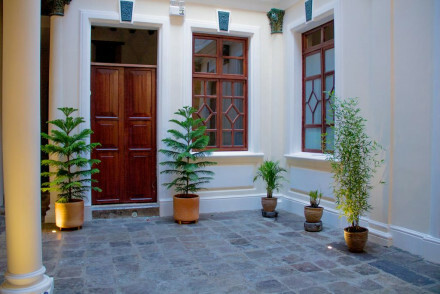 Its 22 traditional, atmospheric rooms surround a central courtyard. Nazu House in Guayaquil is a charming hilltop property with fantastic views of the city. There are eight traditionally dressed rooms with beamed ceilings and beautifully tiled floors. Outside are pretty gardens and a large pool. The Mansion Alcazar is a restored mansion in the centre of Cuenca, a short walk from the city's hotspots. The hotel’s 19 rooms are decorated with antiques, and have parquet floors and free-standing baths. The hotel also has a glamorous restaurant. 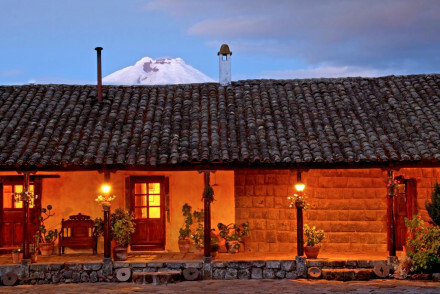 The Hacienda Cusin on the Ecuadorian Sierra, is a lovingly converted estate with 44 charming rooms and incredible views. This is the kind of place to inspire you to explore the great outdoors and you’ll come back of an evening ready to feast on the regional cuisine. The Hacienda Zuleta is a luxuriously converted, 14 rooms ranch with floor to ceiling windows and beautiful decor. Spend your days riding horses or exploring the land on foot, before returning to a superb home-cooked Ecuadorian dishes. A truly authentic rural experience. Mashpi Lodge in Cariaco, is a contemporary eco-hotel and research centre in the Ecuadorian forest, with 22 slick rooms and incredible views of the forest. The decor is minimalist, so as not to get in the way, and the restaurant is excellent. Perfect for an adventure. The Hosteria Dos Chorreras is a bit less of an adventure, but still a rural charmer, set outside the historic city of Cuenca. This is a great place to stay to get the best of both city and country living. The Tanusas Retreat & Spa is a colourful eco-resort in a tropical spot, with just ten secluded rooms. The food is amazing, and locally sourced and there’s a rejuvenating spa. This is the perfect Ecuadorian beach escape. Comfortable and affordable, the Casa Gardenia is a chic, boutique-style hotel in Quito’s historic heart. There are just nine rooms and they’re slick and contemporary, with exposed brick, parquet floors and plenty of light. A great spot to explore from. Casa al Eden is another well-priced option in Quito. This six room B&B is elegant, and well positioned in the historic centre of town. And the breakfast is hearty and homemade. 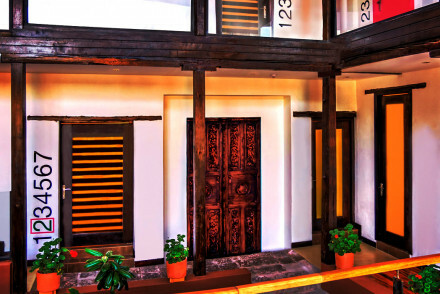 The Hotel Santa Lucia is a traditional, affordable choice in historic Cuenca. Its 20 rooms are arranged around a pretty central courtyard and have high ceilings, sash windows and some lovely antiques. Direct flights to Ecuador’s two international airports, Mariscal Sucre International Airport in Quito, and José Joaquín de Olmedo International Airport in Guayaquil leave from few hubs, but notably from Madrid, Amsterdam, Miami and Atlanta. 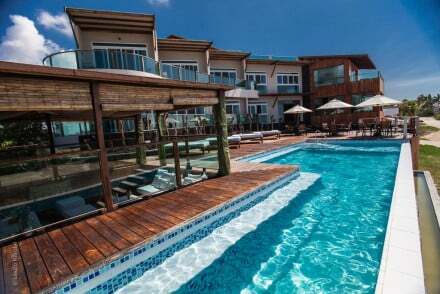 Still not sure which is the best place to stay in Ecuador for you? or the best places to stay on the Galapagos Islands? A chic boutique hotel in the heart of the historic city. Slick contemporary rooms are minimalist in design with exposed brick, polished parquet floors and plenty of light. A cafeteria provides a quiet spot for a quick bite. Ideally situated for city exploring. Fabulous. Local exploring - Located in the heart of the historic centre and within walking distance of many of the main attractions. Local markets - Shop for local artefacts at the Artisan Market. Sights nearby - Visit the iconic Virgin of El Panecillo. A small, yet perfectly formed, B&B in the centre of Quito. Elegant rooms feature light wooden floors, large sash windows and pops of colour come from traditional throws. Homemade breakfasts hit the spot. Perfectly located to explore the historical city. Local exploring - A smart B&B located in Quito’s Historical Centre with many of its attractions within walking distance. Sights nearby - The Plaza de la Independencia and the church of San Francisco are within a ten minute walk. Local markets - Scour for local artefacts at the Artisan Market in Plaza Foch. A charming hilltop property with epic city views. Traditionally dressed rooms feature beamed ceilings, tiled floors and white washed walls. A large swimming pool, set in pretty gardens, is the perfect spot for unwinding. A tranquil base with easy access to both the city and surrounding countryside. Local exploring - Set in a quiet hilltop location with as easy access to Coubertin Park as to the city's attractions. Sights nearby - Visit the impressive Guayaquil Metropolitan Cathedral. 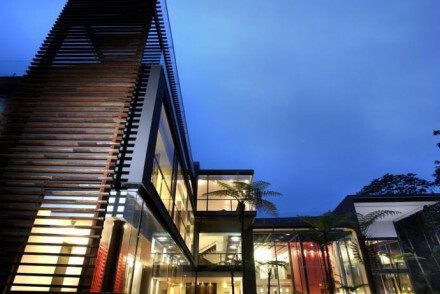 A gleaming contemporary eco hotel and research centre deep in the Ecuadorian forest. Slick rooms feature floor to ceiling windows opening onto views across the forest and minimalist style. Feast on local delicacies with a creative twist in the excellent restaurant. An adventurer's paradise. Back to Nature - An eco lodge deep in the forest of Ecuador’s Andean foothills. Birdwatching - The biodiversity of Chocó Bioregion provides habitat for an outstanding amount of species.